The grizzly is Canada's second largest land living predator after the polar bear. Reason enough for the Royal Canadian Mint to add a coin to its Call of the Wild series, which magnificently presents this bear and its bloodcurdling roar in almost completely pure gold. Because in addition to its extremely detailed motive, what is special about the coin is its particularly high fineness of 999.99/1000, the highest degree of purity available in the world for gold coins. The coin is packaged within a certificate of authenticity in credit card format, which not only provides suitable packaging but also facilitates handling and storage of the coin. 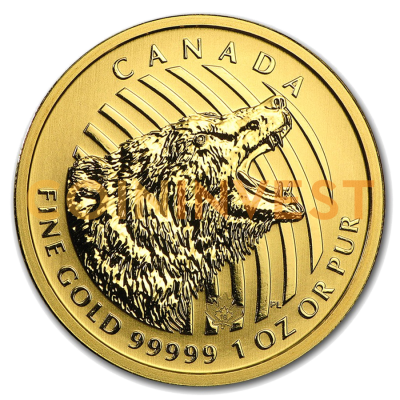 As a particularly detailed coin with an extremely high degree of purity, the Roaring Grizzly is the jewel of any collection. Take the opportunity to purchase your copy today!